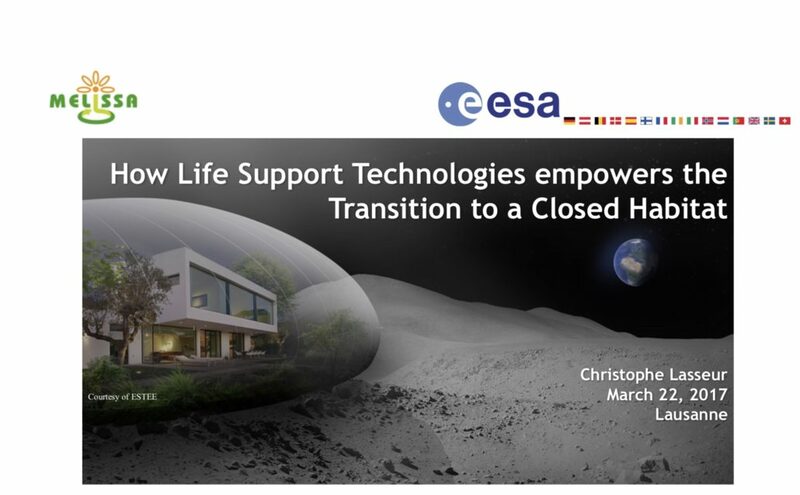 Dr. Christophe Lasseur Discusses “Building on Mars” at EPFL. MELISSA PROJECT MANAGER, DR. CHRISTOPHE LASSEUR DISCUSSES “BUILDING ON MARS” AT EFPL. ABSTRACT: In the case of such a very special building project, the crucial stake for sustainable development is the fact that space systems are extreme cases of environmental constraints. In- deed, they constitute an interesting model as an analogy can be made between Martian utmost conditions and some of the possible extreme one’s that Earth might soon face. The didactic ob- jective of the project is to use the context of a building on Mars to teach an approach which raises the students awareness to design and plan all steps of a building in a sustainable way, i.e. build, with the available resources, living spaces that satisfy human needs and leave as intact as possible the external environment. The paper presents the approach and the feedback of this student project, more specifically ENAC Learning Unit”, which involved 17 students from envi- ronmental, civil engineering and architecture sections from EPFL. All the same, it involved pro- fessors from all three domains, as well as aerospace and Mars specialists, which gave seminars during the course of the semester. The students were separated in groups, and the project con- sisted of two phases: 1) analysis of the context and resources, 2) project design and critic. Both organisational, technical and pedagogical aspects of the experience are presented. The outcome was very positive, with students experiencing for their first time multidisciplinary work and the iterative process of design under multiple constraints. http://est2e.com/wp-content/uploads/2019/01/Dr-Christophe-Lasseur-presentation-at-EPFL.jpg 1282 2074 Lyndon Adade http://est2e.com/wp-content/uploads/2016/03/ESTEE_logo_black_redesign_website_03.png Lyndon Adade2017-03-22 09:25:212019-01-31 09:29:56Dr. Christophe Lasseur Discusses “Building on Mars” at EPFL.